A broken denture can cause a great deal of physical and mental discomfort, while being a big inconvenience in your life. Dentures may become damaged in a variety of ways including impact, biting a hard object, natural wear and tear and more. When you have a damaged denture, you need immediate care to prevent further damage to the appliance or injury to yourself. 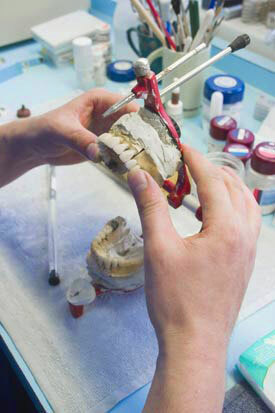 DDS Dentures + Implant Solutions can often provide same-day denture repair capable of restoring your denture to a functional state thanks to our in-house denture repair lab. If your denture cannot be completely renewed, DDS Dentures + Implant Solutions will advise you of the condition of your denture and will recommend steps needed in preventing further breakage and, if necessary, getting a new denture created. Damage to your dentures can occur suddenly or gradually. Poor fit is one of the leading reasons people need cracked denture repair. As you speak or chew, your dentures apply pressure on one another repeatedly. Over time poor fitting, misaligned dentures will over stress a specific area, causing a break that will only continue to worsen. Impacts, including dropping your denture, can cause damage to the tooth or gum area of the denture. Furthermore, any metal clasps – common in partial dentures – may come loose due to wear and tear. All of these situations require immediate repair from a professional. Although do-it-yourself repair kits are available, their results are inconsistent and may even cause further issues since they may not address the underlying cause of your cracked dentures. Trust professionals like DDS Dentures + Implant Solutions. Sometimes, misaligned dentures can be addressed with a professional relining service. DDS Dentures + Implant Solutions provides hard, soft and temporary denture relines. When you live with cracked or misaligned dentures, you risk more than just your physical health. Damaged dentures will only worsen over time, and require more extensive and costly repairs. Choose DDS Dentures + Implant Solutions now and get the repair you need at the best price – thanks to our Price Beat Guarantee. Often, our low prices already beat those of our competition. Our Price Beat Guarantee states we will save you at least 10% over a competitor’s comparable services. DDS Dentures + Implant Solutions also offers a variety of convenient payment options including cash, credit card, and short-term payment plans via CareCredit or LendingClub. We’ll also work with you to help you maximize your insurance reimbursement and answer any questions you have. You can reach us by phone at: (844) 693-3688 or find the nearest DDS Dentures + Implant Solutions location near you.